It’s not very often that we’re pushed by a fellow designer to create custom retail kiosks that are even more unique than what we’ve already designed for them, but this was the case when working with store designers at Bon-Ton on their new Endless Aisle Kiosks. 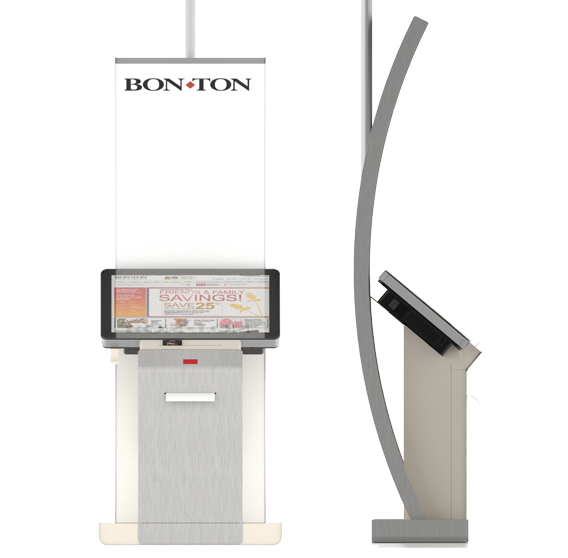 During our initial design conversations with Bon-Ton, it was decided that the kiosks would be placed near store entrances. 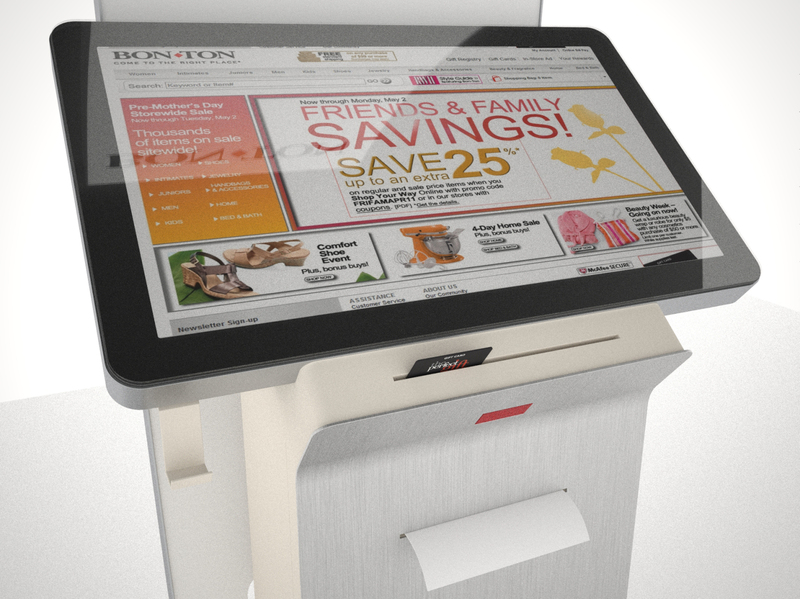 We created a stylish but simple kiosk design that met Bon-Ton’s needs. However, after that first meeting, Bon-Ton designers and store planners decided it would be best to move the kiosks further into the interior of the store, in order to reach more shoppers. The designers requested the addition of the rear sign wing, so the kiosk could be easily recognized from afar. And since the kiosks would often be placed next to existing fixtures, the designers also requested the addition of brushed Aluminum panels, allowing the kiosks to match, creating a cohesive aesthetic. 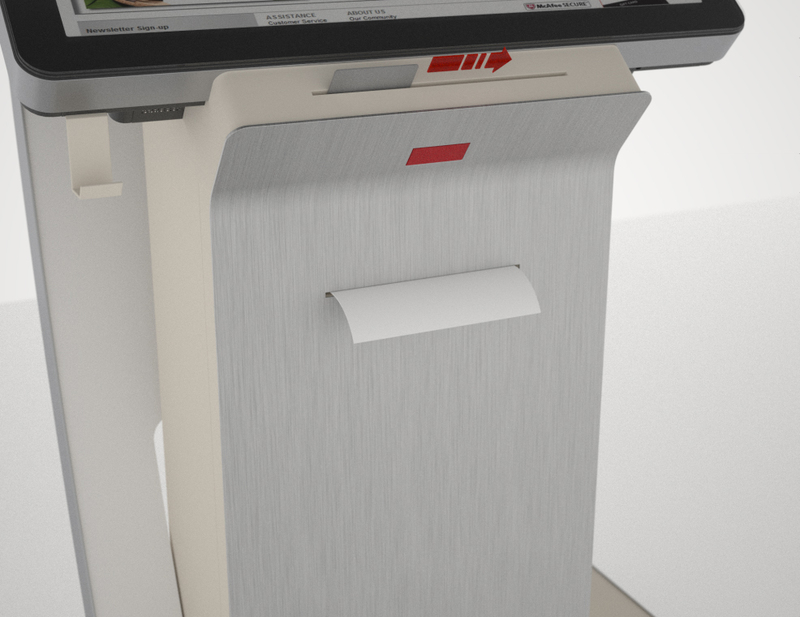 Some of the more intricate features of the new kiosk design include an embedded card swipe reader, located at the top edge of the door, just below the monitor, that allows a very clean gap to swipe a card. The kiosks also feature NCR’s new dual- sided thermal printing technology, and a barcode image scanner that can not only scan product tags, but also barcodes and QR codes on cell phone screens. The results, as you can see, are beautiful kiosks that serve as Endless Aisle Kiosks as well as product look-up kiosks. Dual or triple functionality in kiosks is becoming very popular as retailers finding more ways to service customers and gain a quicker ROI on their Kiosk investment. For Olea, Bon-Ton serves as a shining example of what can happen when a client is willing to roll up their sleeves and dig in to the inner workings of design. Bon-Ton’s vision and knowledge of their client base and store atmosphere, combined with Olea’s ability to create virtually any kiosk concept, is what allows projects like this to come to life. Allowing the kiosk to blend with existing fixtures. 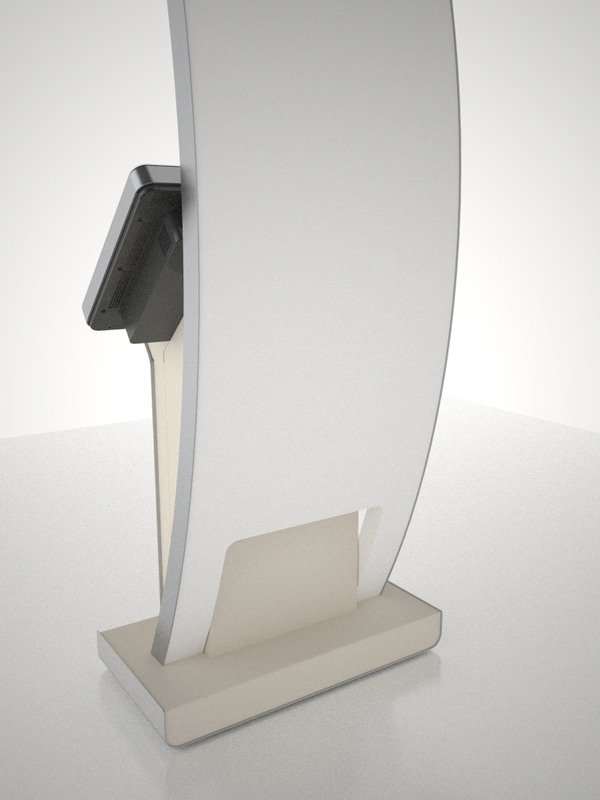 Curve rear panel so the kiosk could be easily recognized in the stores.